A strong legal framework is a fundamental requirement to ensure the environmental and safety risks of shale gas development are mitigated and managed effectively. There are 16 Acts and regulations relevant to the UK oil and gas industry as well as 14 separate pieces of European legislation. These are not specific to shale gas, but are applicable to any oil and gas activity during exploration and production. This legal framework includes the Petroleum Act 1998, the Environmental Planning Regulations 2010, and the Town and Country Planning Act 1990. These are governed, overseen and supported by several regulatory and administrative bodies. 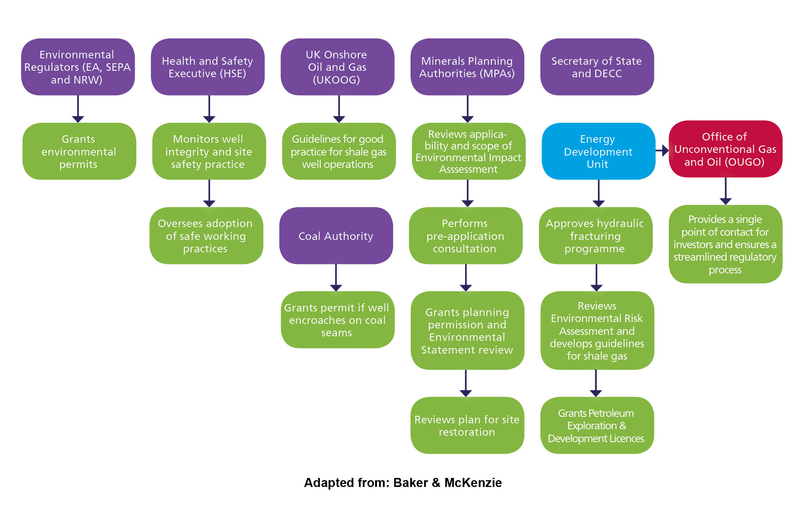 The chart below shows the roles and responsibilities of regulatory and administrative bodies for oil and gas onshore exploration and appraisal phases in the UK. Once commercial viability of the development has been determined, planning consent will be sought for a full production site. A new Environmental Impact Assessment (EIA) and a Field Development Plan (FDP) will be submitted to the relevant authorities. The submission of the FDP by the operator marks the start of the production phase. At this stage, associated equipment, such as pipelines and gas processing facilities, will be constructed, subject to the successful completion of additional planning applications. In the UK, as outlined in the Petroleum Act, all mineral rights, including shale gas, are entrusted to the Crown, and licenses for oil and gas exploration and production are granted by DECC and the Secretary of State for Energy and Climate Change. Permission to commercially operate must still be obtained from the respective local authority. Consent from landowners is currently required for vertical drilling and, importantly, from any landowner under whose land there will be horizontal drilling. However, in a proposed change to existing trespass laws, companies are likely to be allowed to drill horizontally at depths greater than 300 metres under privately owned land. In order to incentivise early investment in exploration for and development of shale gas in the UK, the government has put in place new fiscal incentives. This reduces the tax burden from the current level of 62% to as low as 30% on onshore oil and gas profits.